You know those winter mornings when you can’t decide between two coats? The Kayla Reversible Coat solves that problem! Crafted from a soft wool blend, the coat has two reversible sides, with one light grey and the other dark grey. Cut to hit below the knee, the coat has two front pockets and classic collar. Stylish and oh-so-convenient, hire it for a work function or a daytime event. Layer the versatile coat over tailored trousers and a silk blouse for a polished work function outfit. Complete with classic stud earrings available for rent. Check out our blog for our tips on how to get ready for work functions! 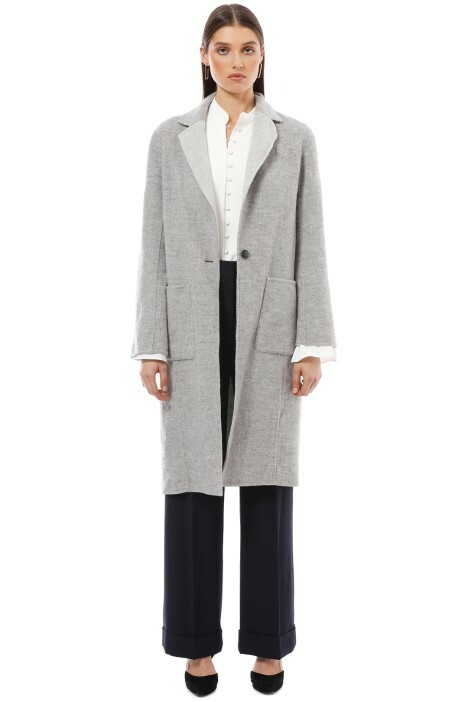 Pair this coat with the Enzo Blouse in White and the Celine Wide Leg Pants. LENGTH: This coat extends to midi length.